Movie: "The Incredible Melting Man"
Steve West (Alex Rebar) is the lone surviving astronaut from a mission-gone-wrong through the rings of Saturn. Whatever solar radiation killed his fellow astronauts has caused his skin to start melting off his body. This phenomenon has also destroyed his mind and sent him on a murderous rampage, where in order to survive, he kills and feeds on unsuspecting victims. 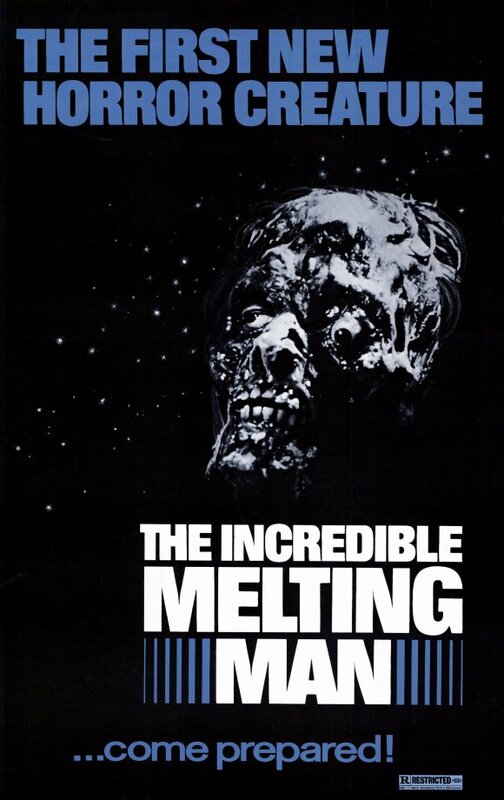 Dr. Ted Nelson (Burr DeBenning) and General Michael Perry (Myron Healey) must find this incredible melting man and put a stop to his killing before the world learns of his existence. Rick Baker does an excellent job on the makeup of the melting man. It's actually quite remarkable how good the makeup in this movie is since it was made in 1977 on a very low budget. He is a truly disgusting sight to behold. You can get queasy just looking at him. There is plenty of gore beyond the melting man, as victims body parts are often scattered about the screen. What's not to love about splattered guts, bursting brains, and half of an ear hanging from a tree branch!? The plot is pretty bad, but Rick Baker's makeup work helps the movie out tremendously and gives it a stomach-churning level of gore. It has some intentional and unintentional humor that lends to it's overall enjoyment. The men tasked with finding the melting man are pretty bad at their jobs. Despite how crucial finding him supposedly is, the doc has no problem stopping by his house for some lunch and a quick chat with his wife. After the general arrives, they seem to search for a short time and they briefly stop at a crime scene before heading back to the doctor's house for dinner and a long break. Come on guys, we thought this was a matter of national security! It seems really cheesy, but ends up being sort of intriguing to watch because of its cheese factor. Beyond the makeup, this is not a great movie. There are a lot of places during the film where it seems like the writers simply ran out of ideas and were struggling to stretch the measly, undeveloped ones into a full-length feature film. There are better horror movies out there, but if you're really into FX makeup and you don't mind the ridiculous plot and lack of good acting, maybe give this movie a whirl! One year ago, we were watching: "The Skin I Live In"